Ever since picking up some knowledge about the REITS (Real Estate Investment Trusts), keen to to learn more about the actual realt estate thingy i.e. the Property Investment. Yesterday, via an invite from a friend, attended a 2-hour plus oversea property investment seminar (co-presented by the local property guru, Mr Patrick Liew) at Suntec City. It is an eye opener for me (in learning the insights of oversea property investment, especially in Melbourne, Australia context). To some of you, what I am going to share might be kindergarden stuff, so if you are already quite there in real estate investment, you may quietly leave now...else, thanks for continuing..
As this is not the first time I've attended Patrick Liew's presentation, he repeated his sharing of his very, very, very, very, very, very, very, very poor growing up phase (hope I didn't under-stated the number of times of "very" he literally said) and how he enjoyed the delicious kway-teow soup he received only once-a-year! It is kind of inspiring, by the way. The objective of this seminar is not to up-sell any of their property courses/seminars but to share the potential landed property investment opportunity from Melbourne, Australia. The marketing aspect aside, I've learnt some salient points from the one plus hour of sharing. Since sharing is my forte, just like to openly share it out here to my readers as well as refreshing my memory. 2. The Stage Release And Price Control strategy that being practiced by the developer all of the world i.e. They will sub-divide a plot of land into different releases (by stages) and controlling the number of offering units (proportionate against the numbers of potential buyers) so that they can uphold the value of the properties. That explains why the common "believe" that the value of properties is usually UP! 3. If you are thinking of investing in Australia's properties, do take note that foreigners can only invest in the brand new properties. 4. Buy what and where the locals buy. 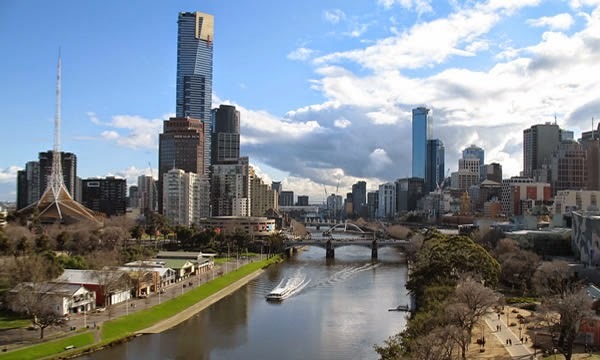 Take the case of Melbourne for example, the locals are usually buying/staying in suburb areas and not the city area. Hence, apartments in the CBD area might not be the best choice (according to the presenter). 5. The Property Cycle is usually about 7 to 10 years. 6. The median house price in Australia doubled every 10 years. In investing, many, many, many will know the theories and strategies part. It is execution part that counts and many , many, many still struggling on the How? I am 100% stock Whore operating in Singapore Stock Exchange only. 9. Your fortune will come from your focus - focus on one market or one technique. A jack of all trades will never become a winning trader. Why? Because a trader must zero in on the markets, paying attention to the details of trading without allowing his emotions to intervene. A moment of distraction is costly in this business. Lack of attention may mean you don't take the trade you should, or neglect a trade that leads to great cost. Focus, to me, means not only focusing on the task at hand but also narrowing your scope of trading to either one or two markets or to the specific approach of a trading technique. Have you ever tried juggling? It's pretty hard to learn to keep three balls in the area at one time. Most people can learn to watch those 'details' after about 3 hours or practice. Add one ball, one more detail to the mess, and few, very few, people can make it as a juggler. It's precisely that difficult to keep your eyes on just one more 'chunk' of data. Looks at the great athletes - they focus on one sport. Artists work on one primary business, musicians don't sing country western and Opera and become stars. The better your focus, in whatever you do, the greater your success will become. Alamak!!! Too long to read. I know you will skip a few lines and miss out important pointers!!! Why keep focusing on Method when most of investing success and performance proven to come from Mind and Money. 5. Money management is the creation of wealth. Sure, you can make money as a trader or investor, have a good time, and get some great stories to tell. But, the extrapolation of profits will not come as much from your trading and investing skills as how you manage your money. I'm probably best known for winning the Robbins World Cup Trading Championship, turning $10,000 into $1,100,000.00 in 12 months. That was real money, real trades, and real time performance. For years people have asked for my trades to figure out how I did it. I gladly oblige them, they will learn little there - what created the gargantuan gain was not great trading ability nearly as much as the very aggressive form of money management I used. The approach was to buy more contracts when I had more equity in my account, cut back when I had less. That's what made the cool million smackers - not some great trading skill. Ten years later my 16-year-old daughter won the same trading contest taking $10,000 to $110,000.00 (The second best performance in the 20-year history of the championship). Did she have any trading secret, any magical chart, line, and formula? No. She simply followed a decent system of trading, backed with a superior form of money management.